In the previous videos, we've covered all the basic functions and features of the WordPress administration area. Now we're gonna dig in a little deeper and talk about how to customize the look of your WordPress site. WordPress uses themes to determine the overall design of a site, including the colors, layout, and typography. There are thousands of themes to choose from enabling you to build just about any type of site you can imagine, from a personal blog to a business site, or even eCommerce. We're currently using the default WordPress theme called 2017, which is ideal for creating a blog or a business site. The theme customizer enables you to make changes to your site's appearance and preview those changes before publishing them. On the right-hand side is a live preview of your site with the current theme and settings applied. As you make changes to the options on the left-hand side, the preview updates in real time. Click the Edit icon next to any item in the preview to edit that particular item. The top of the customizer indicates the name of the active theme. Click the Change button to view other themes that are currently installed on your site. You can view a live preview of what your site content would look like in any of these themes, or click the Customize button to return at any time. The options available in the customizer will vary depending on the features supported by your current theme, but most themes include these basic customizer controls. Site Identity enables you to upload a logo, which will appear next to the site title and tagline. You can also edit your site's title and tagline and you'll see those changes in real time. If you've uploaded a logo, you may choose to hide the site title and tagline altogether. You can also upload or select a site icon, which will be used as the shortcut icon in your web browser. Note that icon images must be at least 512 pixels and square. You can edit the color scheme used throughout your site choosing from the default Light or Dark color schemes. Or if you prefer, you can choose a Custom color scheme using the slider. And you can choose a custom color for the header text if you like. This theme also includes support for a header video or background image. You can upload a header video, or better yet, enter the URL to a video hosted on YouTube. You can temporarily hide the customizer controls to get a better look at the preview. To delete the header video, simply remove the URL and the header image will be displayed instead. The current header image is displayed here, and you can hide the header image to completely remove the background section, or add a new header image of your own. I'll upload a header image from my desktop. If necessary, you can crop the image to the correct dimensions. You can upload multiple header images if you like and let WordPress randomly choose a different header image each time your site is loaded. You can also manage the navigation menu that appears across the top of your site. This menu might include links to the most important pages on your site. Now I created this menu earlier and assigned it to the top menu location. You can add items to the navigation menu, including Custom Links, individual Pages or Posts, your post Categories, Tags, or even specific post Formats. And you can choose to automatically add new pages that you create later to this menu. Widgets are independent sections of content that appear in the sidebar or other widget areas provided by your theme. In this theme, the primary widget area is in the sidebar along the right-hand side of the page. To edit the contents of the widget, just click the Edit icon next to the widget you'd like to edit. You can drag and drop to change the order of the existing widgets, or add new widgets at any time. As you can see, there are a number of widgets from which to choose, and we'll cover those in a later video. Now, by default this theme displays the latest blog posts on the Home page in chronological order, but you can also use a static page for the front page instead. First, you'll need to create a page that will serve as your Home page. I'll click the link to Add a New Page and we'll simply call this page Home. Next, we'll also need to add a new page to display our blog posts. With these two new pages created, all of our blog posts will now be displayed on the Blog page, and we have a new static front page as the Home page of our site. With our newly created Home page selected, we'll see that a number of new front page sections have been created with placeholder text. We can edit each one of these either by choosing one of our existing pages from the dropdown list, or creating a new page for each section. To save some time, I'll go ahead and complete the setup, and when it's finished, the Home page can look something like this. You'll notice that each section is preceded by the featured image assigned to each one of these individual pages. And finally, you can also add additional CSS styles to your site overwriting the styles in your theme. For example, I'll enter a simple instruction to change the color of links in our site to blue. You can learn more about CSS from the Help icon at the top. At the bottom of the customizer, you'll find links to preview what your site will look like on tablets or mobile devices. And when you're happy with your changes, click Save &amp; Publish to keep these new settings. Or to discard your changes and close the customizer, simply click the X in the top left-hand corner. You can quickly access the customizer at any time from the WordPress Dashboard, and while you're logged in to your site as an administrator, you'll also find a link to the customizer as well as other frequently used functions in the toolbar that appears across the top of your site. The Themes subpanel in the Appearance menu is where you manage your installed themes.The current theme is highlighted and next to it are other installed themes that are also available for use on your site. Click on a theme to view more detailed information about that theme. At the bottom, you'll find a series of buttons to launch the customizer, edit Widgets and Menus, or change the Header and background of your theme.Clicking the arrow at the top cycles through each installed theme, and the Live Preview button enables you to see what your actual site content would look like with the new theme applied. You can customize the theme settings and then Save &amp; Activate the new theme with a click. To add a new theme, click the large button at the bottom of the theme's page. In this panel, you can search thousands of free themes from the wordpress.org themed directory, and when you find a theme you like, you can preview or install it with just a couple of clicks. In addition to the free themes available in the WordPress theme directory, there are also thousands of professionally-designed themes created by commercial theme shops. These themes often include more features and even better support. If you've already purchased a commercial theme, you can use the Upload function to install the .zip archive containing your new theme files. 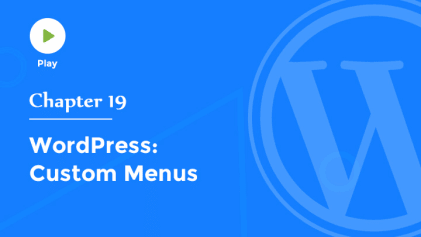 WordPress will automatically upload the theme files to the correct location on your web server, and once a theme has been uploaded, you can view a live preview to see what your site content will look like when the new theme is activated. Again, you can make changes to the theme options in the customizer, and when you're happy with what you see, Save &amp; Activate the new theme with a single click. As you can see, these tools make it really easy to build just about any type of website you can imagine in WordPress and personalize it to make it completely unique.